OSHA cited Fraser Shipyards Inc. with willful egregious health violations for each of 14 workers who were overexposed to lead while they retrofitted a ship's engine room. Test sampling conducted by OSHA inspectors showed the workers' had lead levels up to 20 times the exposure limit. Inspectors additionally issued five willful violations for the company's failure to conduct monitoring to assess employee exposure to lead, implement a lead compliance program or a respiratory protection program for lead, and provide training on lead and asbestos hazards. Workers were also exposed to other heavy metals. OSHA opened its health inspection—which also resulted in citations for 10 serious violations—after receiving multiple complaints of unsafe working conditions. 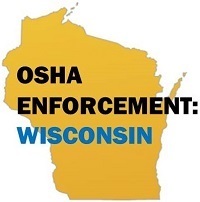 OSHA issued proposed penalties of $1,395,000 and placed the Wisconsin shipyard operator in the agency's Severe Violator Enforcement Program for failing to address safety and health hazards. "Fraser Shipyards accepted a contract with a very low profit margin and penalties for delayed completion, but could not meet the schedule without endangering its workers," said OSHA Assistant Secretary Dr. David Michaels. "When companies prioritize profits and deadlines over the health and safety of their workforce, it is the workers who pay the price. Law-breaking employers must be held accountable for their unlawful behavior." For more information, see the news release. In recent weeks, millions of American workers have been exposed to extreme temperatures across the country. During a heat wave, employers should plan additional precautions to reduce the risks of heat exposure. Those steps include gradually exposing workers to hot environments, providing frequent water breaks, allowing ample time to rest, and providing shade. As previously reported in QuickTakes, on June 27 OSHA Assistant Secretary Dr. David Michaels hosted a conference call featuring several employers and employer groups that are making noteworthy efforts to protect workers. These efforts include holding heat-safety stand-downs, and providing additional protections such as cooling vests and shade canopies. 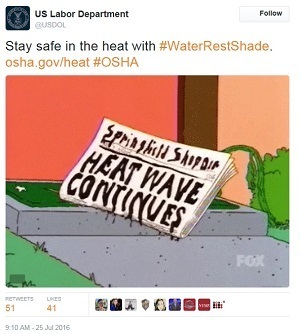 OSHA wants to hear how employers and safety professionals are keeping workers safe from extreme heat. Post your photos to Twitter using #WaterRestShade or email stories to OSHA.QuickTakes@dol.gov for possible inclusion in a future issue of QuickTakes. RWS Manufacturing Inc. was cited and fined $197,820 in penalties after an OSHA follow-up inspection found the company exposed workers to explosion, fire and fall hazards. The Queensbury, N.Y., wood shavings manufacturer failed to correct combustible dust hazards involving its dust collection system, as it had agreed to following an inspection in 2012. Wood dust, when suspended in the air, can explode with a force that can kill workers and destroy entire buildings. "Especially disturbing is the fact that, since OSHA's last inspection, a significant fire occurred in the plant's production area in December 2015," said Robert Garvey, OSHA's area director in Albany. The company also failed to inspect fire extinguishers annually and remove wood dust that created fire and slip, trip and fall hazards. Read the news release for more information. OSHA cited Evraz Inc. with 11 serious and repeat violations after the company exposed workers to safety hazards at its Pueblo, Colo., steel-making facility. The agency conducted the inspection under its National Emphasis Program for Amputations. Violations found included: lack of guardrails on open-sided floors and platforms; failing to properly inspect the operation of overhead cranes and make needed repairs; and failing to provide bumper stops to prevent rail cars from rolling in a crosswalk or vehicular traffic. The company was issued proposed fines of $103,820. See the news brief for more information. A Macy's department store in Aventura, Fla., was cited for repeated and serious safety violations after OSHA inspectors found blocked exits and electric shock hazards. A complaint of workplace injuries and hazards led inspectors to the facility where other violations found included: padlocks on exit doors; workers exposed to fire hazards because exit routes were not clearly marked; and workers exposed to electric shock from unprotected wiring to outlet boxes. Inspectors also cited The Finish Line Inc., an athletic footwear and apparel store renting space in Macy's store, for failing to keep the storage area uncluttered and for blocking exit routes. OSHA proposed penalties of $103,220. Read the news release for more information. Staffing agencies and host employers are jointly responsible for maintaining a safe work environment for temporary workers — including, for example, ensuring that OSHA's training, hazard communication, and recordkeeping requirements are fulfilled. In two recent cases, OSHA held both the host and temporary employers responsible for violations of OSHA standards. In Alabama, OSHA inspected automobile parts manufacturer Pyongsan America Inc.'s Auburn facility and found that both permanent and temporary employees faced the dangers of being caught in machinery or hit by objects and the risk of suffering amputations. The inspection was conducted as part of OSHA's Regional Emphasis Program on Safety Hazards in the Auto Parts Industry. The agency cited Pyongsan and its staffing firm, Surge Staffing LLC, for 11 safety violations, including four repeat citations to Pyongsan. Combined, the companies face $106,020 in penalties. For details, read the news release. In Texas, oil and gas equipment manufacturer Exterran Energy Solutions LP and its staffing firm, South Texas Specialty Welders LLC, were cited for a combined 34 safety violations, including two repeat citations for Exterran. OSHA issued proposed penalties of $120,800 following a complaint-initiated inspection. The repeat citations were issued because the employer failed to ensure proper disposal of contaminated materials and did not ensure proper labeling of containers with hazardous chemicals. OSHA cited Exterran in 2014 for similar violations at the same worksite. For details, read the news release. Michigan OSHA issued $205,400 in penalties to Blue Diamond Steel Casting in Pigeon for 23 safety and health violations. MIOSHA inspectors determined that the company overexposed workers to welding and iron oxide fumes, failed to provide training on how to prevent the unintentional activation of furnaces during servicing, and did not guard workers from several pinch points and movements from a robotic machine. For more information, see the MIOSHA news release. California OSHA issued $52,810 in fines to LC General Engineering & Construction Inc. of San Francisco for safety and health violations after a worker was run over by a steam roller and hospitalized for serious injuries. Cal/OSHA inspectors concluded that the company failed to ensure that the steam roller was under control at all times, operated by a trained qualified worker, kept in gear when descending grades and controlled by an operator aware of workers on foot in the work area. A Pennsylvania pallet company agreed to pay $105,000 for wrongfully firing an employee who complained – first to the employer and then to OSHA – about hazardous mold at the company's Biglerville plant. IFCO Services N.A. Inc. also must provide every employee at the worksite an OSHA handout that explains legal protections for whistleblowers against employer retaliation. OSHA's investigation found that the company violated the anti-discrimination provision of the Occupational Safety and Health Act when it terminated the worker for engaging in protected activities under the Act. For more information, read the news release. OSHA has entered into an agreement with U.S. Steel resolving a lawsuit alleging two workers were wrongfully suspended for violating the company’s immediate injury or illness reporting policy. OSHA investigated plants in Clairton and West Mifflin, Pa., after the workers filed complaints. OSHA found the company violated Section 11(c) of the Occupational Safety and Health Act when it retaliated against the workers for reporting workplace injuries several days after the incidents occurred. The settlement requires the payment of back wages to the workers and significant changes in U.S. Steel's reporting policies, including an agreement to immediately abolish and never reinstate the company's policy requiring employees to immediately report an injury. The policy made it impossible for employees to comply when they were unaware at the time of an incident that they had suffered an injury or illness. In response to a series of tragic workplace incidents in the Philadelphia area, OSHA is calling on the region's construction companies to ensure their workers have and use the proper equipment to protect them from work-related falls. Falls accounted for 40 percent of all fatalities investigated by OSHA's Philadelphia Area Office since October 2015. OSHA, the City of Philadelphia's Licenses and Inspections and the Philadelphia Project on Occupational Safety and Health have joined forces on a new safety campaign, "Grassroots Injury-Illness Prevention." Launched last month, the campaign will foster collaboration among employers, workers, labor union and other workplace safety advocates on construction site safety and health issues. Read the news release for more details. Visit OSHA's Stop Falls webpage for more information on fall protection. The Montana Department of Labor and Industry, Safety and Health Bureau is offering free training to employers and workers during SafetyFestMT August 16-18 in Bozeman. Subjects include OSHA's 10- and 30-hour safety training in general industry and construction, OSHA recordkeeping requirements, conducting internal safety audits, and building a workplace safety culture. Those interested in attending should register online by the Aug. 7 deadline. To better coordinate workplace safety and health protections and services, OSHA and the Wage and Hour Division of the U.S. Department of Labor have established an alliance with the New York State Workers' Compensation Board. Under a Memorandum of Understanding, the agencies will invest resources over the next three years to cross-train their staffs, conduct joint investigations, and provide employers and workers with information on safety and health compliance assistance. For more information, read the news release. The Scoular Company, which operates a grain elevator at a facility in Helena, Ark., contacted OSHA's On-site Consultation Program in 2009 to strengthen its safety culture. After working with OSHA consultants, Scoular's workplace safety and health hazards were abated; its recordkeeping improved; and 100 percent employee involvement in the safety process. OSHA accepted Scoular in the agency's Safety and Health Achievement Recognition Program in 2012. After five years without any workplace injuries or illnesses, the company serves as a model for worksite safety and health. For more information, see the online success story. The On-site Consultation Program provides free and confidential safety and occupational health advice to small and medium-sized businesses across the country. On-site Consultation services are separate from enforcement and do not result in penalties or citations. Visit OSHA's website to find the local On-site Consultation Program office in your state or territory. 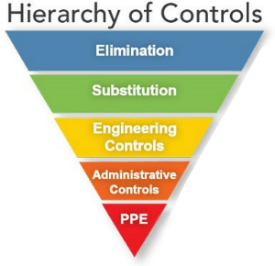 The National Institute for Occupational Safety and Health's new Engineering Controls Database provides information on effective engineering controls that can protect workers by eliminating or reducing hazardous conditions. It is based on a hierarchy of controls ranked in order of effectiveness. Well-designed engineering controls can be highly effective in protecting workers and frequently lower operating costs over the longer term. The database can be searched by occupation or work process to find a solution that may work to control the exposure in your workplace. QuickTakes Subscription list at the above webpage. Thank you.